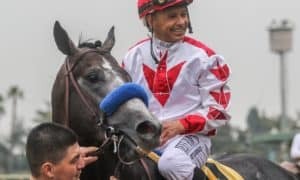 DEL MAR, CA – In a race as entertaining as its namesake, Agave Racing Stable and Jeff Wilke’s Ransom the Moon won a wild edition of the Grade 1, $300,000 Bing Crosby on Saturday. 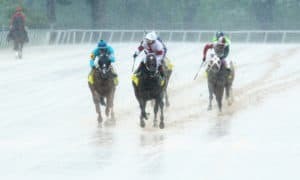 The theatrics began as the field was loading into the starting gate. Magic Taste forced his way through his front gate, injuring jockey Tiago Pereira’s leg in the process. The gate crewman managed to hold on tightly to Magic Taste, not allowing him to get more than a length away before stopping him. Pereira appeared to limp as he walked back to the starting gate but managed to re-board his steed. 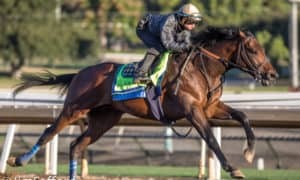 Once the field was finally settled, the gates burst open, and the defending Breeders’ Cup Sprint champion Drefong exited nicely. 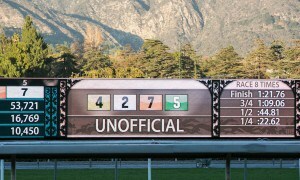 Off at 9/5, that move from the gate was unfortunately the last nice thing that he would do in the race. As the field exited the chute and began to pass the unused first turn, Drefong suddenly shot left hard. 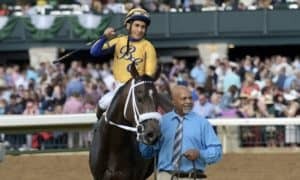 Jockey Mike Smith did everything in his power to redirect the 4-year-old colt, but to no avail, as Drefong shot the gap and bucked off the Hall of Famer. Drefong’s antics weren’t over there, though. 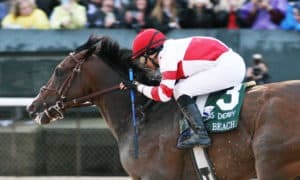 He managed to regroup and kept running along the rail, eventually skimming along until he reached the leader, St. Joe Bay, while along the inside of Roy H and Moe Candy and just ahead of Ransom the Moon. The field moved well enough down the backstretch, with St. Joe Bay posting early fractions of :22.19 and :45.52. Through the far turn, however, Drefong showed that he had one final disruption left in him. While Roy H and Moe Candy passed St. Joe Bay to the outside, Drefong made a surge up the rail. Once clear of St. Joe Bay, Drefong drifted very wide, forcing Roy H and Moe Candy to check up while swinging into the 7- and 8-path range. Jockey Flavien Prat, already running in a perfect stalking position aboard Ransom the Moon into the turn, suddenly saw the entire track open up in front of him. Prat pounced and drove Ransom the Moon hard down the stretch. Roy H managed to recover and fought back gamely (with Drefong still to his inside). The pair began to close on Ransom the Moon but ran out of time. Ransom the Moon crossed the line in first, 1 1/2 lengths ahead of Roy H.
Moe Candy was another 1 1/2 lengths back in third. 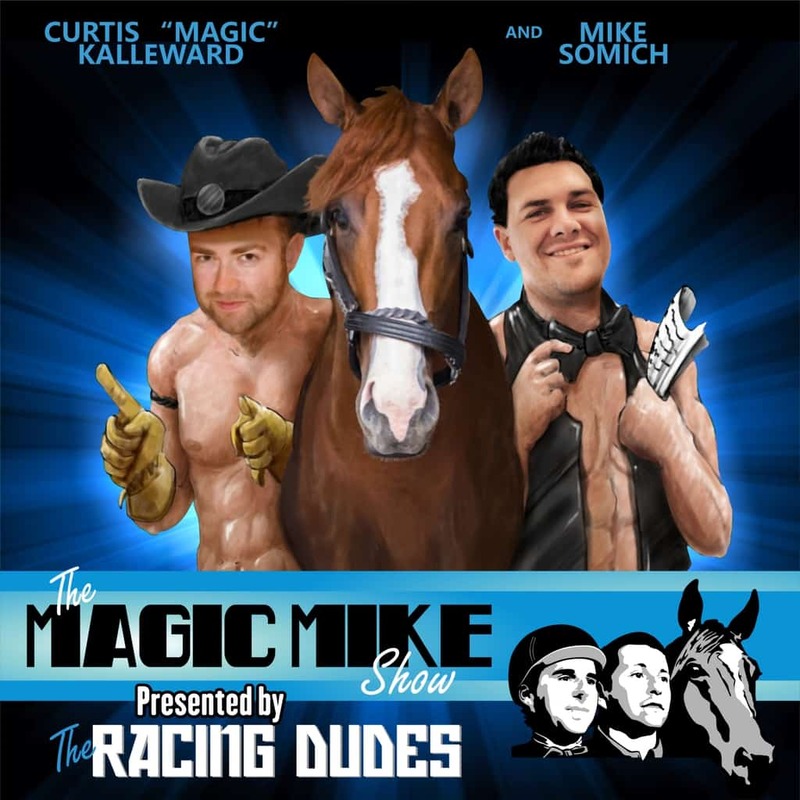 Kobe’s Back, Solid Wager, Denman’s Call, Magic Taste, and St. Joe Bay completed the order of finish. Big Macher and Coastline were scratched. Ransom the Moon raced his first three years at Woodbine for his breeder, Sam-Son Farm. 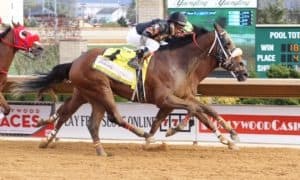 After ending 2016 in Canada, the 5-year-old son of Malibu Moon was privately purchased and relocated to trainer Phil D’Amato’s southern California barn. 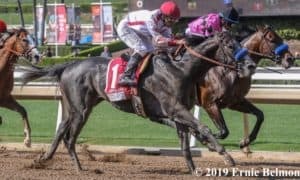 Winning his April 30 debut in an optional claimer at Santa Anita, Ransom the Moon won the Grade 2 Kona Gold Stakes and followed that with a well-fought second in the Grade 2 San Carlos Stakes. 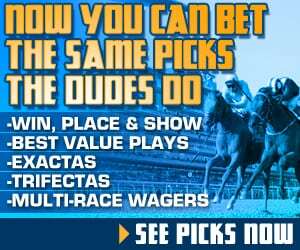 The $180,000 winner’s share increased his career earnings to $520,829. 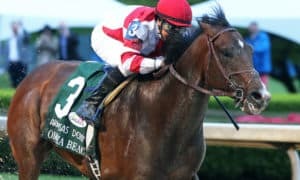 The Bing Crosby is a Breeders’ Cup “Win and You’re In” event, with Ransom the Moon receiving an automatic berth in the $1.5 million Twin Spires Breeders’ Cup Sprint at Del Mar on Saturday, November 4. Ransom the Moon returned $10.80 to win, $4.20 to place, and $3.60 to show. Roy H brought back $3.20 to place and $2.80 to show, while Moe Candy paid $5.60 to show.